Labour would "in effect" end the freeze on benefits through a package of reforms in its first Budget in government, the shadow chancellor says. John McDonnell said his proposals would make the freeze "irrelevant", but did not say whether he would scrap it. Later though, Labour leader Jeremy Corbyn told Sky News the freeze was "unfair" and "would be ended". The party's manifesto includes pledges costing £48.6bn, to be funded from extra tax revenue. Labour says all its pledges are costed, with fundraising measures including a rise in income tax for higher earners, a corporation tax rise, a crackdown on tax avoidance and an "excessive pay levy" on salaries above £330,000. But the Conservatives have said Labour would have to raise taxes dramatically for working families in order to fund their spending commitments. According to their manifesto, the Conservatives have "no plans for further radical welfare reform" and would continue the roll-out of Universal Credit - a single monthly payment to replace many other benefits. The Liberal Democrats have said they would end the benefits freeze and reverse welfare cuts. The freeze on working-age benefits, which came into force in 2016, sees most payments capped at their current rate until 2019. 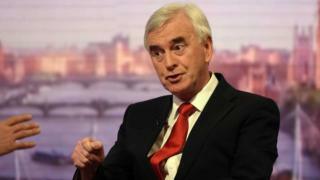 Speaking on the BBC's Andrew Marr show, Mr McDonnell said the proposals the party was putting forward "would ensure that in effect we would be addressing this issue of how we reverse the benefit freeze itself". "I want to do it as part of an overall reform package and not just pick off one by one." He said: "We're putting £30bn in over the lifetime of a Parliament into welfare, we're reforming the whole process... and the implication of that will be... the impact of these proposals will make the freeze irrelevant because we'll reform the whole process." Labour's manifesto includes plans to scrap the so-called bedroom tax, restore housing benefit for those under 21 and increase Personal Independence Payments for the disabled. When pushed about what level of economic growth would be needed for Labour to deliver its plans, Mr McDonnell insisted the party's proposals were "completely cost neutral... because for everything you put in, you get the money back". Mr McDonnell rejected Resolution Foundation findings that 78% of Conservative cuts would not be reversed under Labour proposals. He said his strength of feeling on this issue was such that he would deliver the reforms in the first Budget. Mr Corbyn told Sky News: "Yes, the freeze would be ended because it's very, very unfair on those people in receipt of those benefits." He said £2bn had been set aside "as a start" and "obviously we would review it as time goes on". Asked about immigration, Mr Corbyn said a Labour government would deliver a "fair" system, but would not be drawn on whether he personally wanted to see numbers rise or fall. He said net migration would "probably be lower" in the future, but added: "I want us to have a society that works and I cannot get into a numbers game because I don't think it works." Conservative Work and Pensions Secretary Damian Green described Labour's economic policies as "nonsensical". Mr Green told BBC One's Andrew Marr Show: "The way Labour approaches any problem is to say: There is a magic money tree... we don't need to reform anything, we don't need to change anything, we just need to take money off businesses and people, and that solves the problem."